Considering the acres of press coverage the battle between the UK and Spain over Gibraltar gets, you'd think there would be something worth fighting over. I'm still trying to discover what that is - maybe the Spanish like monkeys? The last colony on mainland Europe, Gibraltar is British owned and so still has Pounds Sterling as its currency. It is a curious glimpse at an anachronistic version of England, though little else. But it does have monkeys. Gibraltar was under Moorish rule for 700 years until the 15th century, when it was conquered by the Duke of Medina Sidonia. In 1704, during the War of the Spanish Succession, the British navy captured Gibraltar. Most of the town's citizens left the city. In the treaty of Utrecht in 1713, Spain ceded Gibraltar to the UK. The phrase used was 'in perpetuity', words which the Government of Gibraltar's Web site continues to use. Despite this, Spain continued to covet The Rock and made several attempts to regain its control, the most famous of which being the Great Siege of 1779-1783. During the Napoleonic Wars, Spain and Great Britain became allies and the Spanish relinquished their claim over Gibraltar. In 1954, Queen Elizabeth II visited Gibraltar. This was to spark a renewed claim by Spain to the sovereignty of Gibraltar. Franco, dictator of Spain at the time, imposed restrictions on movement between Gibraltar and Spain. In 1967 a referendum was held in Gibraltar regarding the colony's sovereignty - the overwhelming majority voted to remain British. Two years later, Franco closes the border between Gibraltar and Spain. In 1982 the restrictions were partially lifted and in 1985 the border was fully reopened. September 10 is Gibraltar National Day - expect to see lots of British flags being waved, if only to antagonise the Spanish. Did I mention there were monkeys? The Rock of Gibraltar is home to some Barbary Macaques, the only wild apes in Europe. Natives of Africa, no one knows how they got to Gibraltar. They're cute but can be quite ferocious, especially if you have an ice cream or a flash car. Walk around the Rock and enjoy the views. Due to the tax-free status of the colony (and you were wondering why they want to remain British? ), electronic goods, cigarettes and alcohol are cheaper than in Spain, though not necessarily as cheap as in other countries. Take a look at this Gibraltar Sightseeing Tour. Gibraltar is a day trip. It is far too expensive to stay in Gibraltar itself. Stay in nearby La Linea or Tarifa. As Gibraltar is a bit of a pain to get to, it's worth doing a Gibraltar Sightseeing Tour. A day is all you need in Gibraltar. West to Cadiz and then to Seville or north to Ronda. It is virtually impossible to get public transport into Gibraltar, but as it is actually quicker to walk in from La Linea, it isn't even worth trying. As you arrive in La Linea, you'll see the way to Gibraltar. 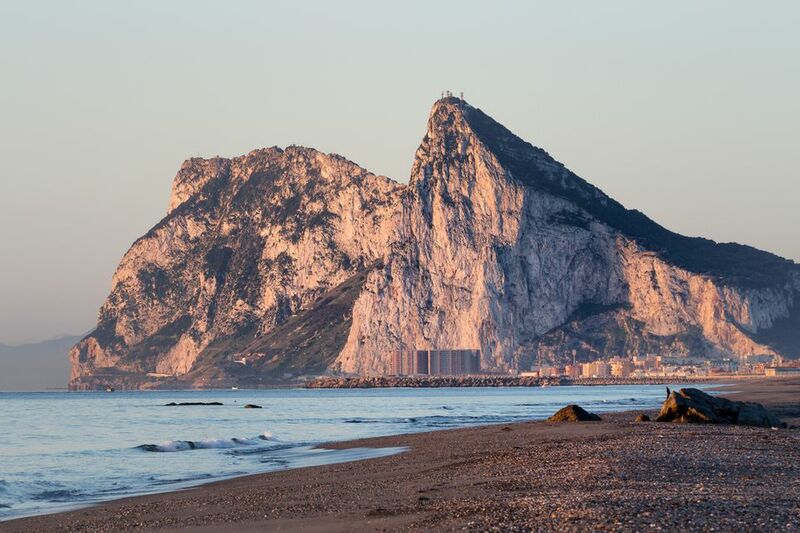 For a start, there's a great big rock (that'll be the Rock of Gibraltar) and secondly, there'll be a huge line of cars waiting to go in so they can smuggle cigarettes and alcohol out. As you walk through passport control (don't forget your passport, you're leaving Spain!) you have to cross what appears to be a huge parking lot. It's actually Gibraltar airport! Once on the other side, it's about a ten-minute walk to Grand Casemates Square, Gibraltar's main square. From there, walk along Main Street (I'll let you guess why it's called that) through Gibraltar's main shopping area. Walk the full length of the street, through Southport Gate. There is a cable car on Red Sands Road which will take you to Apes' Den to see the monkeys.